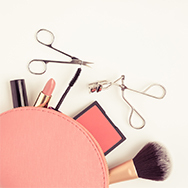 This is it … our pros are spilling their top-secret makeup tricks and beauty hacks that go beyond “been there, tried that.” Whether you’re a beginner or a seasoned makeup artist, there’s something here for everyone. Nailing the perfect cat eye takes the right tools and technique. First, you need a good liquid liner with a thin, precise brush. After that, the key is to start with a thicker slant at the outer corner of your lash line and taper the line as you move inward, but here’s the kicker … end the line about 2/3 of the way in, before your reach the inner corner. The line should be so finely tapered at that point that you don’t see a line of delineation. Why does this help? The inner corner is where mistakes tend to happen, causing you to draw a thicker line all the way across. The thicker line creates a heavier look that seems to close off the eye instead of making it look bigger. By keeping the emphasis on the outer 2/3, you get a lifted cat eye that looks classically clean. For easier blending, layer a soft brown/taupe/peach (or any skin-toned) eye shadow in the crease before applying other shadows. Whether or not you’re using an eyeshadow primer, this allows the darker shadows to blend better when diffusing the color with a fluffy brush. Use a different concealer for under the eyes instead of the same concealer you use for the face. Heavy-coverage matte concealers work great for camouflaging complexion imperfections, but they also can emphasize fine lines and wrinkles and make the undereye area look haggard and dry. Opt for a lighter weight, yet creamier, concealer that has a brightening, luminous finish to keep the eye area looking fresh, young, and hydrated. Reap the longevity of a matte liquid lipstick without the drying feel. We love liquid matte lipsticks, but there’s no denying that most leave lips looking and feeling parched. To prevent that, apply a traditional cream lipstick first, then layer your liquid matte lipstick over it. The cream lipstick acts as a barrier to protect lips from becoming dry, while the liquid matte functions as a sealant to lock in the color. The wear time will be slightly shorter than what you’d get with a liquid matte lipstick alone, but far longer than the wear time you’ll get with a traditional lipstick. For more tips on how to make lipstick last, check out this article. The secret to pulling off a flattering red lip is surprisingly all about your skin. The trick is to make sure you cancel out any red discolorations in your complexion with a neutral-toned foundation or concealer. That allows the red lipstick to shine through in a flattering way on any skin tone … seriously. Searching for your perfect foundation shade? Don’t test it on the back of your hand or the inside of your arm. The skin colors in those areas tend to be different from your face, so you might end up choosing a shade that’s too dark or too light. Instead, test foundation on bare skin by swatching it on the side of your jaw and then checking it in daylight to make sure it looks right (store lighting just doesn’t cut it). After you’ve applied foundation, use a clean makeup sponge to spot-check the blending along the hairline, jawline, under the eyes, and around the nose. These areas tend to “collect” foundation or show signs of uneven application, so taking a few seconds to double-check and blend with the sponge makes a huge difference. It’s even better if you can check it with a handheld mirror in daylight—mistakes are more evident in natural lighting. Customize how you apply makeup primer. If you have different skin textures/issues on different areas of your face (many of us do), consider applying your primer strategically instead of all over. For instance, pat a wrinkle-blurring primer under the eyes and an oil-reducing primer over the T-zone. Instead of purchasing cream blush, use your favorite lip color on your cheeks. Just dot it onto the apples of your cheeks, then blend with your finger or a makeup sponge. Ta-da! You’ve just saved yourself some $$$, or, at the very least, have a new hack for touching up your blush on-the-go. Found a blush that you love, but the color goes on too strong? Tone it down by mixing in a highligher of the same texture. This will soften the pigmentation and give your complexion a healthy glow—win, win.